You made it to Thursday. It’s all downhill from here! For this Thursday Throwback, we have our good friend Chris Holt aka the Toy Viking to talk about the Kidrobot x The Simpsons Devil Flanders Medium Art Figure. 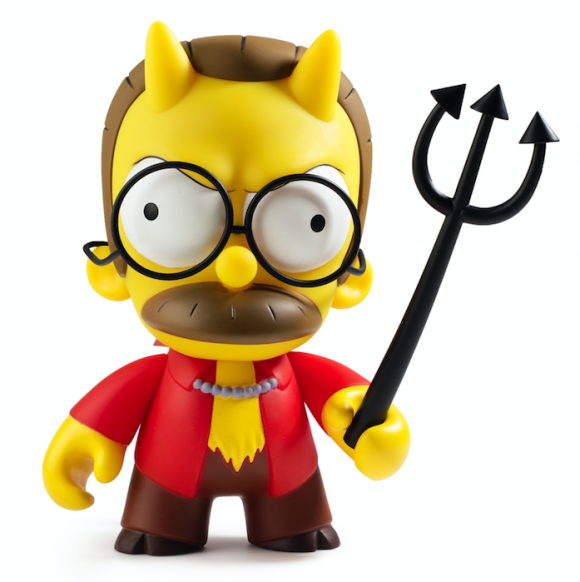 We’re throwing it back to the good ol town of Springfield with this Devil Flanders medium figure from Kidrobot. Speaking of the devil, someone I work with told me recently that his grandson, who is only 6, started learning the violin. I asked if he was sure that the kid wasn’t training to compete in a fiddle battle with Beelzebub and he did not think that was as funny as I did. It’s been a long time since I’ve been in school, and learning to out riff the dark one himself seems more valuable than calculus does, but whatever. This figure is of course based on the uber popular (and my personal favorite thing from The Simpsons) Treehouse of Horror episode, where Homer sells his soul for the price of a single donut. As they are prone to, shenanigans then ensue and the rest you’ll have to watch for yourself because I refuse to ruin the entire story for the one person that hasn’t seen it yet. By the way, we know who you are and we are very disappointed. You know that if we’re focusing our Throwback Thursday on The Simpsons, that something really cool from that series is probably debuting tomorrow. Until then you can invite the world’s most famous neighbor over for a negotiation or two by visiting www.kidrobot.com.